I didn't make the trip to Denver and the Great American Beer Festival this year. Last year was my first. I'll go again. Maybe next year. Regardless, it's always interesting to watch what transpires in the medal ceremony, some of which I watched via streaming. Surprises and trends. If you're looking for summaries, look elsewhere. The complete results are posted on the GABF site and are sortable by state, beer, medal, etc. You can also find local and state coverage on The New School and Beervana blogs. The first surprise for me was Omission Pale Ale winning a gold medal in Classic English Style Pale Ale category. What's odd about it? Omission is a gluten-reduced beer winning in a standard category. The lager version of Omission won gold in a standard category two years ago, so maybe the Pale winning shouldn't be considered a giant surprise. Still. Another surprise was MacTarnahan's Amber Ale winning silver the same category. This beer is ancient. I used to drink a lot of it back in the dark ages. I don't consider it a pale ale, but nevermind. MacTarnahan's has won before in this category, but not lately. I sampled a bottle of it earlier this year and it seemed pretty solid. Anyway, good news for Portland Brewing. It wasn't a surprise, but it was good to see pFriem do well. The brewery won medals for its Pilsner and Druif, a mixed culture specialty beer. More importantly, perhaps, pFriem was named Mid Size Brewery of the Year. Anyone who's been to the pub in Hood River or had their beer in any form knows this award is well-deserved. Finally, one of Oregon's prime medal suspects faltered this year. Breakside won four medals in 2017, three in 2016. It's IPA won a gold in 2014. But no medals this year. This despite the fact that the brewing program there appears to be as solid as ever. Go figure. With the number of breweries across the country rising almost exponentially, GABF competition has has added new medal categories regularly. There were 160 total medals awarded in 2000. The number ballooned to 239 in 2010. This year, 306 medals were awarded. It isn't that hard to figure out why. The brewery count is approaching 7,000. We have a growing number of styles and substyles represented in the marketplace. A good way to to keep everyone interested and focused is to increase the number of available medals. Viola! Just over 2,400 breweries entered the beer competition this year. The only state not represented was Mississippi. We don't know the number of breweries per state. That's info the Brewers Association doesn't release in my experience. We do know that about 8,500 entries were evaluated by 239 judges from around the world. That's a crazy amount of beer to taste. With the brewery count expanding everywhere, I wondered what might be happening to Oregon's share of the awarded medals at GABF. The website provides a handy way to look back at past years and determine how many total medals were awarded and how many Oregon won. I took a look at the medal count every third year over the last 12 years Why 12? I don't know. It made sense for the task. I wanted to see if there was any kind of obvious trend without plotting every year. Anyway, I looked at 2018, 2015, 2012, 2009 and 2006. You can see by way of the graphic what's happened. In 2018, Oregon won roughly 7 percent of the awarded medals. That was about the same as 2015 and 2006, but down from the better than 9 percent won in 2009 and 2012. Looking at every year 2006-2018, the lowest medal count was 11 in 2007. The highest was 25 in 2013. So Oregon breweries are winning an average of about 20 medals a year, while the number of awarded medals is increasing. Is there any kind of notable trend? Not really. The medal count has bounced around a bit. I'm going to guess a rate of around 7 percent will begin to look like the new norm due to the growing number of breweries, better techniques and improved beer quality. But that's strictly a guess. Just for fun, I looked at a few states that have seen significant increases in brewery count from where they were in 2006. Texas and Florida are in that boat. Between them, they won just four medals in 2006. This year, Texas and Florida combined to win 25 medals. Big change. There's also California, which has more breweries (more than 900 by the end of 2017) than any other state and has always done well at GABF. California won 16 percent of the awarded GABF medals in 2009, 24 percent in 2015 and 23 percent in 2018...a case of the rich getting richer. Taking this exercise a step further, I looked at what's happened to Portland's share of Oregon medals over the same period. Portland has been a leader in the craft beer renaissance, but Oregon has a growing number of breweries (281 at the end of 2017) and a lot of them are winning GABF medals. What do the stats say? 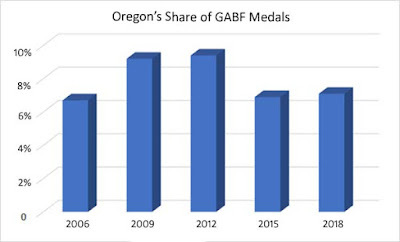 The answer is that Portland's share of GABF medals appears to be in gradual decline. Portland brewers won 42 percent of the state's medals in 2006. This year, the share dropped to 31 percent. Similar numbers pop up for 2012 and 2015. 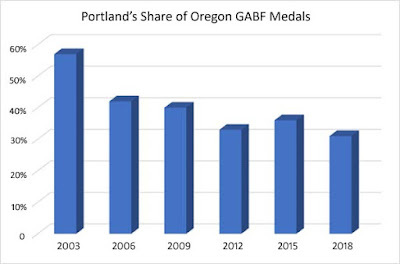 The decline looks worse if you include 2003 (which I did in the graph), when Portland won 57 percent of the state's GABF medals. What does it all mean? It mostly means the craft revolution is expanding. The cities and states where the movement began and flourished have helped spread the word through the sharing of appropriate techniques and best practices. Craft beer is being assimilated. The end result is that GABF medals are being won all over the country. Also known as good news for the industry.